4E D&D is different from its forebears in many ways, perhaps none so much as the emphasis on tactical combat. The battle map is a prerequisite for most combat encounters, and you need some way to keep track of player and monster movement. For the Essentials products, which were my introduction to 4E, tokens are the primary method for doing this. A huge variety of tokens are included in the Red Box, DM Kit, and Monster Vault. You can easily run an entire campaign using only the tokens included in these boxed sets. Though the tokens are great, I like to use miniatures whenever possible. They are somewhat easier to use in battle, and they certainly add much to the game’s visual appeal. The drawback is that they are far more expensive. It would cost hundreds, if not thousands of dollars to purchase a collection of minis that could compete with the aforementioned set of tokens. Most DMs don’t have the budget to do this, and so the typical D&D tabletop probably includes both miniatures and tokens. Thankfully, there is. 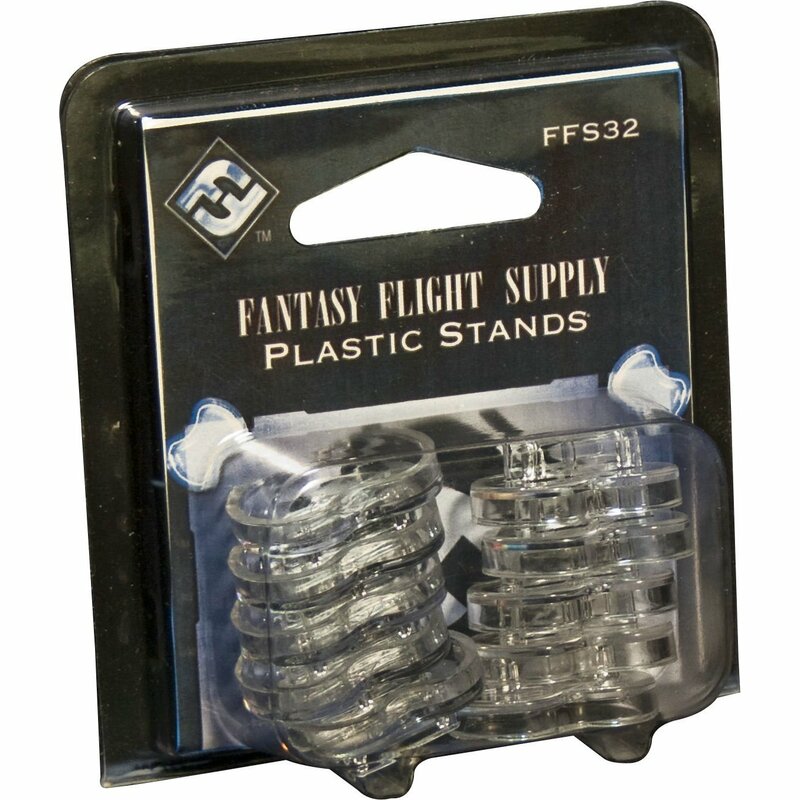 I found a nifty little product at my friendly local game shop, the rather plainly titled “Plastic Stands” from Fantasy Flight Supply. Included in this package are ten clear plastic stands that are the perfect size to hold your tokens upright. The package cost around $4 at my game shop, which seems a bit expensive for what are, in essence, cheap little pieces of plastic. On Amazon, they are a little more expensive. However, I found the cost well worth it, since the tokens look so much nicer when standing up this way. The bases fit easily in a one inch square, just right for medium-sized tokens. I used these stands in my last two sessions, and they were a big hit. The art on the tokens looks great next to the miniatures. I much prefer having a stand-up token representing a lizard man warrior instead of reusing the same miniatures that were, say, orcs last week. We simply ignore the bloodied side of the tokens, and use the same mini hair clip condition markers we have for the miniatures. The only drawback to the plastic stands is that the tokens don’t fit snugly on all of them, for whatever reason. A bit of clear nail polish on the stand’s two tabs should solve this problem rather nicely (a good trick I picked up fixing loose joints on super hero action figures and Transformers). You can, of course, fit in larger tokens if you wish. Large sized tokens like the carrion crawler in the pictures are quite intimidating when standing upright. The only issue with this is the stand doesn’t take up the full space of four squares. Perhaps gluing a few of these clear stands to 2″ wooden disks from a craft supply store might be a good idea. Huge tokens fit in the stands, too, but the base problem is even worse. It seems most tokens I use regularly are medium sized, though, and the bases work perfectly for these. 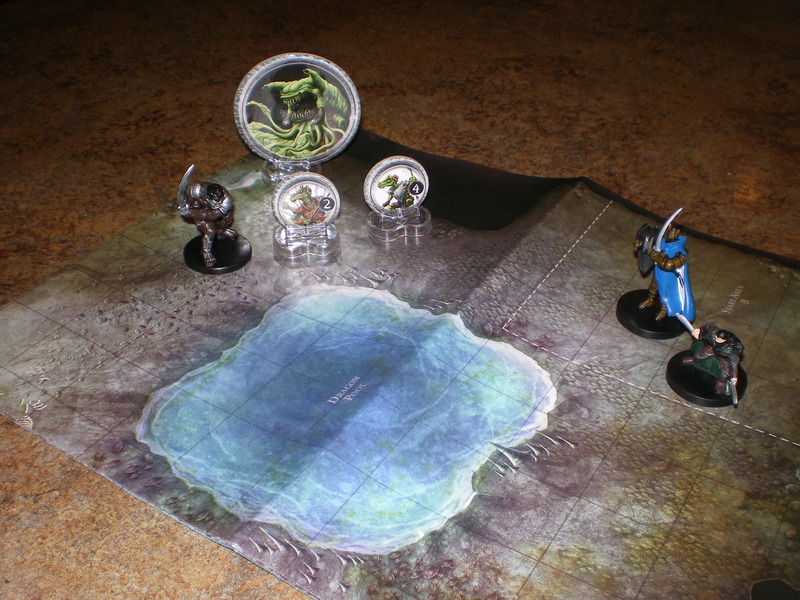 I am very happy with using these clear plastic stands for tokens on my battlemaps. It may seem like a small improvement, but it really makes a big difference in actual play. The tokens are easier to move and blend in much nicer with standard miniatures. 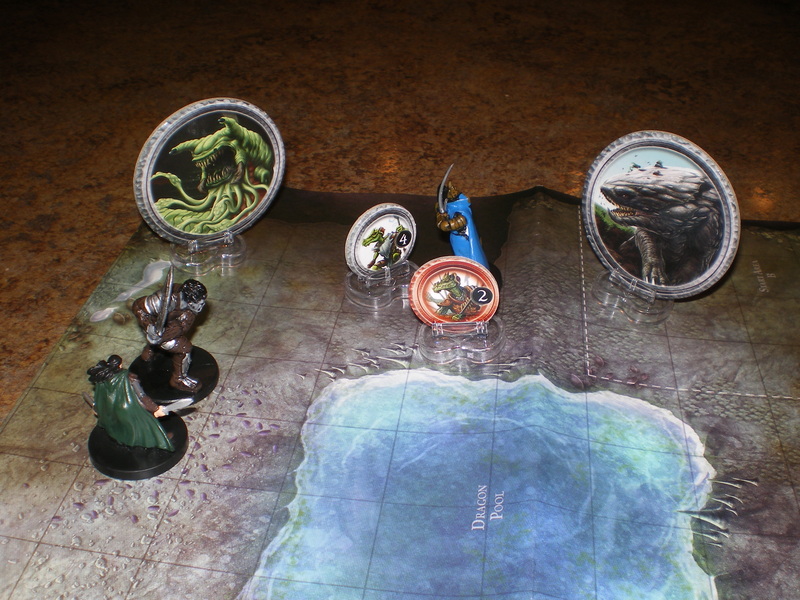 If you can’t afford a huge library of miniatures, but want a more 3D appearance to your monsters and villains, tokens on plastic stands can work very nicely. If Gamma World has tokens, you really should try these stands. It may seem like a small thing, but it makes a world of difference.